Most of the time, any movie that has Adam Sandler speaking with an accent or goofy voice (The Waterboy, Little Nicky) isn't very good. But that's mostly a coincidence, because it's not the accents that are turnoffs but the characters themselves, who can simply be annoying or uninteresting. That's why it comes as such a welcoming surprise that Sandler's Zohan, an Israeli counter-terrorist, is so likable, affectionate and, ironically enough, gentle (not all counter-terrorists are like that). Right off the bat, let me say You Don't Mess with the Zohan is one of Sandler's funniest comedies. I don't like to start reviews with this kind of praise, but in the long and winding road of Adam Sandler comedies, which can be hit or miss, this means something. 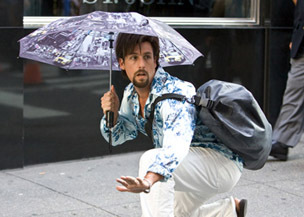 Thankfully, Zohan has more in common with Austin Powers than Big Daddy or Mr. Deeds. It's not mean and pandering like those movies, nor does it go for unearned sentimentality during the final act. It's often hilarious and there were a dozen or so times I found myself laughing out loud. Had it gone through the editing process one more time, and perhaps trimmed ten minutes off itself, it would have been even tighter, but I'd rather have it be a little slow than offensive. The movie opens as Zohan (Sandler) struts down the beach in his cutoff jeans and sleeveless shirt. He shakes his hips and sticks out his bulging crotch (this is actually more funny than it is disturbing). The wind blows in Zohan's unruly hair as he poses for the women, plays Hacky Sack with the guys, and engages in tug of war with a bull. The images are zany and over-the-top, but they contain a tongue-in-cheek quality that lets us know everybody is having fun. Zohan's vacation gets interrupted by the Israeli army, who once again need the expert Mossad agent to capture his arch nemesis, a Palestinian terrorist who calls himself The Phantom (John Turturro). But Zohan is tired of always being the go-to guy when it comes to thwarting Israel's enemies. He doesn't find counter-terrorism fulfilling any more and tells his mother and father (Dina Doronne and Shelley Berman) he wants to go to America to be a hair stylist, "to make the hair silky smooth." They laugh in his face.